USES: This medication is used to treat seizure disorders, certain psychiatric conditions (manic phase of bipolar disorder), and to prevent migraine headaches. It works by restoring the balance of certain natural substances (neurotransmitters) in the brain. HOW TO USE: Read the Patient Information Leaflet provided by your pharmacist before you start taking divalproex sodium and each time you get a refill. If you have any questions, consult your doctor or pharmacist. Take this medication by mouth as directed by your doctor. You may take it with food if stomach upset occurs. Swallow the tablet whole. Do not crush or chew the tablet, which can irritate the mouth or throat. Dosage is based on your weight, medical condition, and response to therapy. Use this medication regularly in order to get the most benefit from it. Remember to use it at the same time each day to keep the amount of medication in your blood constant. If this medication is used for seizures, do not stop taking it without consulting your doctor. Your condition may become worse if the drug is suddenly stopped. Your dose may need to be gradually decreased. 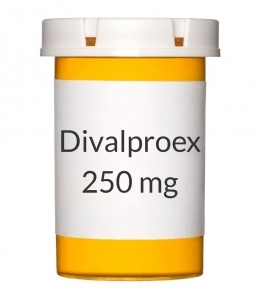 Divalproex sodium does not relieve acute migraine headaches. Take other medications as directed by your doctor for acute attacks. Inform your doctor if your condition does not improve. DRUG INTERACTIONS: Your healthcare professionals (e.g., doctor or pharmacist) may already be aware of any possible drug interactions and may be monitoring you for them. Do not start, stop or change the dosage of any medicine before checking with them first. Before using this medication, tell your doctor or pharmacist of all prescription and nonprescription/herbal products you may use, especially of: certain antidepressants (e.g., amitriptyline, nortriptyline, phenelzine), certain benzodiazepines (e.g., clonazepam, diazepam), certain antibiotics (carbapenems such as doripenem, imipenem), mefloquine, other medications for seizure (e.g., carbamazepine, ethosuximide, felbamate, lamotrigine, phenobarbital, phenytoin, rufinamide, topiramate), rifampin, warfarin, vorinostat, zidovudine. Low-dose aspirin, as prescribed by your doctor for specific medical reasons such as heart attack or stroke prevention (usually these dosages are 81-325 milligrams per day), should be continued. Consult your doctor or pharmacist if you are using aspirin for any reason. Tell your doctor or pharmacist if you also take drugs that cause drowsiness such as: antihistamines that cause drowsiness (e.g., diphenhydramine), medicine for sleep (e.g., sedatives), muscle relaxants, narcotic pain relievers (e.g., codeine), psychiatric medicines (e.g., phenothiazines such as chlorpromazine), tranquilizers. Check the labels on all your medicines (e.g., cough-and-cold products) because they may contain ingredients that cause drowsiness. Ask your pharmacist about the safe use of those products. This drug may affect certain lab tests (e.g., urine ketones). Make sure laboratory personnel and your doctors know you use this medication. This document does not contain all possible interactions. Therefore, before using this product, tell your doctor or pharmacist of all the products you use. Keep a list of all your medications with you, and share the list with your doctor and pharmacist. STORAGE: Store the US product at room temperature below 86 degrees F (30 degrees C) away from light and moisture. Do not store in the bathroom. Store the Canadian product at room temperature between 59 and 77 degrees F (15-25 degrees C) away from light and moisture. Do not store in the bathroom. Keep all medicines away from children and pets. Do not flush medications down the toilet or pour them into a drain unless instructed to do so. Properly discard this product when it is expired or no longer needed. Consult your pharmacist or local waste disposal company for more details about how to safely discard your product.